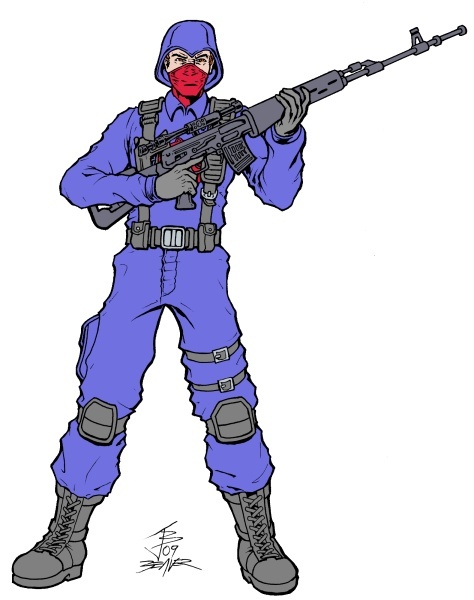 I originally drew this sometime around October during a G.I.JOE shindig/happening. I needed to redraw the pic to fix a few things and forgot to leave room to fix other things. The main problem is that I drew the pose without knowing who the character would be and the Dragunuv rifle that the C.T. 's use threw the balance of this pic all out of whack. The design is a minor mix of the original figure (especially the web gear) and the recent 25th Anniversary remake (the realistic boots). This is one of those pics that I finished just because I know a few people who may like it. This could be good for a background or graphics or something but not as a solo picture. So there won't be a Joesplosion background for it.